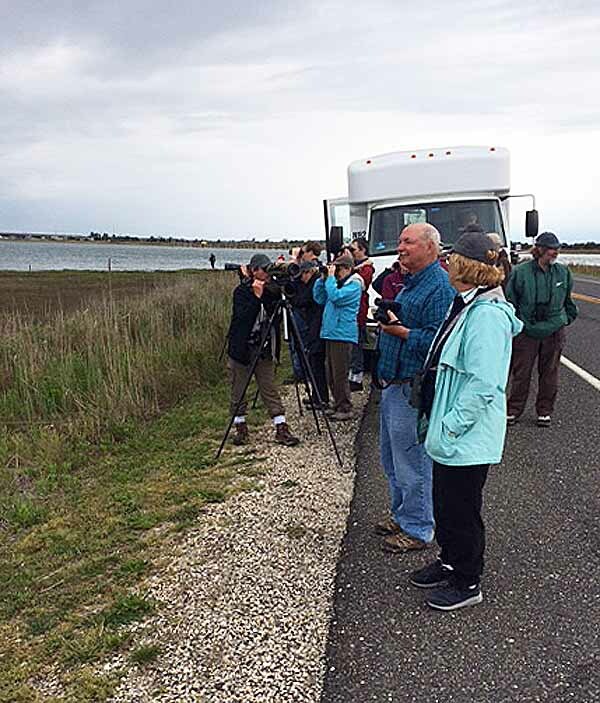 Join us on a 2 ½ hour Birding Cruise aboard the 40 foot Eco-tour boat The Skimmer - a partnership between Skimmer Tours and the Cape May Bird Observatory. 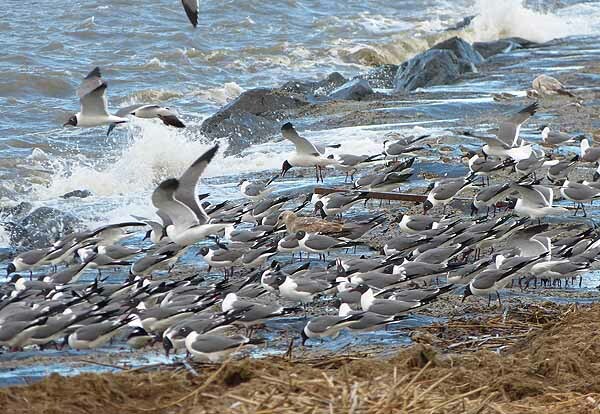 While you enjoy your craft beer of choice (BYO Brew), we will explore the Cape May Coastal Wetlands Wildlife Management Area in the back bays of Cape May and Wildwood, which is one of the most amazing natural areas in New Jersey. 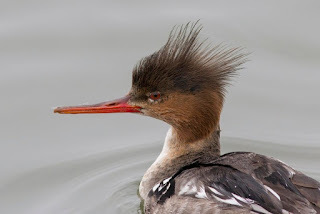 You’ll see dozens of nesting ospreys, a number of heron and egret species, a variety of terns, gulls, and a large variety of migrating shorebirds. The elusive Clapper Rail is also a regularly seen species from our boat. A portion of the trip is dedicated to bird and wildlife research so, if you like, you’ll assist our Naturalist/Research Associate in identification and data collection at an area of interest in the marsh. As mentioned, this is a BYOB event. We offer a variety of non-alcoholic drinks for sale on the boat and will provide light snacks (pretzels and/or nuts). Although we highly recommend you partake in a craft beer from one of a number of local breweries, feel free to enjoy your brew of choice or a glass of wine. No hard liquor please. 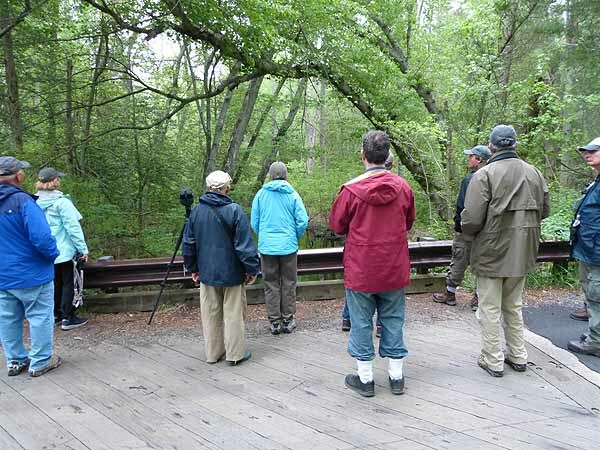 With forests, hemlock glens, marshes, streams, and bogs, there is no better place than High Point State Park and Stokes State Forest in northern New Jersey to hear a diversity of bird songs in a concentrated area, from Cerulean and Blackburnian Warblers to Ruffed Grouse and Barred Owls. Plan to begin early for dawn chorus and lunch in the field, ending by early afternoon each day. 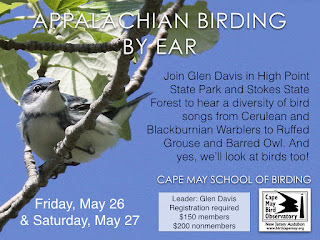 This workshop is entirely in the field and, yes, we will look at birds like Cerulean and Chestnut-sided Warblers, Yellow-bellied Sapsuckers, and over 100 others there to be heard or seen. 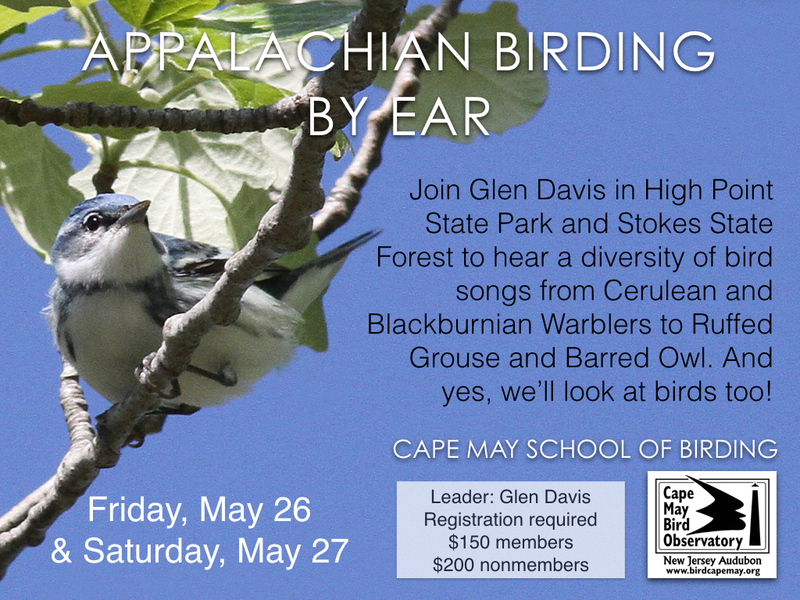 Join Glen Davis on this exciting Cape May School of Birding Workshop. 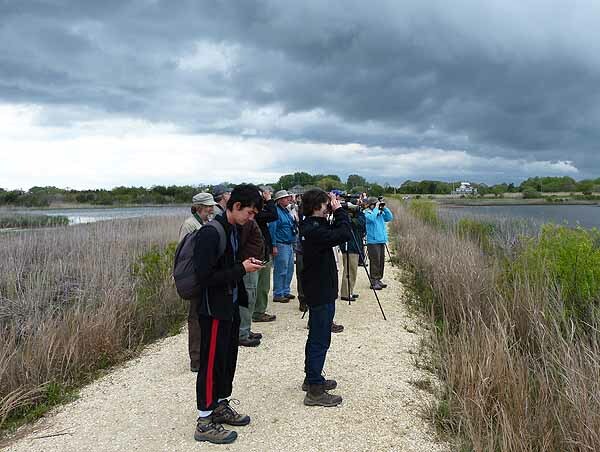 The World Series of Birding is an annual competition and fund-raiser for nature and environmental organizations in which teams try to see or hear as many bird species as possible inside a 24 hour period (midnight to midnight) and inside the state of New Jersey. It’s held on a Saturday in the first half of May, May 6th this year. It was begun in 1984 by Pete Dunne and others, and the first year there were thirteen teams. This year there were 71 teams and hundreds of participants. Since its inception, the event has raised more than ten million dollars for the organizations involved. Our team, the Cape May Bird Observatory Century Run began in 1987, I believe. My first year was 1988, and though I’ve missed a few years, I’ve participated about 25 times. The event is a mixture of exciting (when you find good things), frustrating (when you don’t), a cool nature adventure, an exhausting experience, and usually lots of fun. 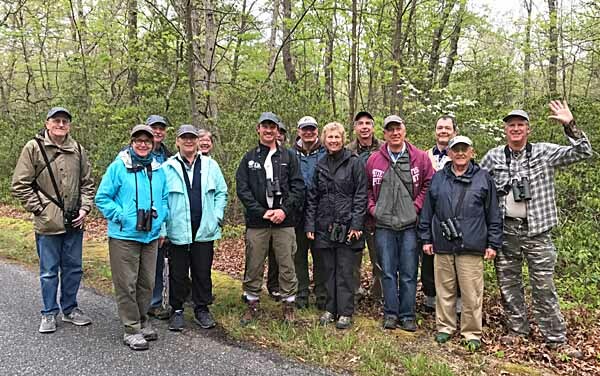 Every year a core group of fans and supporters help me contribute to the cause of the Cape May Bird Observatory’s mission of conservation, education and preservation, and I’m glad they were there for me again this year. I could always use additional pledges and support - more about that at the end of the article. Our 2017 team had 15 members. I can’t identify all of them by name, but I will point out this year’s team leader, Brett Ewald, center, in the black jacket. Brett is the new CMBO program director and an expert birder. The two people to the right of him in black and magenta, respectively, are Kathy and Roger Horn, the team planners, along with Patti Domm. Patti works on logistics and with sponsors. Roger and Kathy plan the route, do most of the scouting, and keep everyone on point. 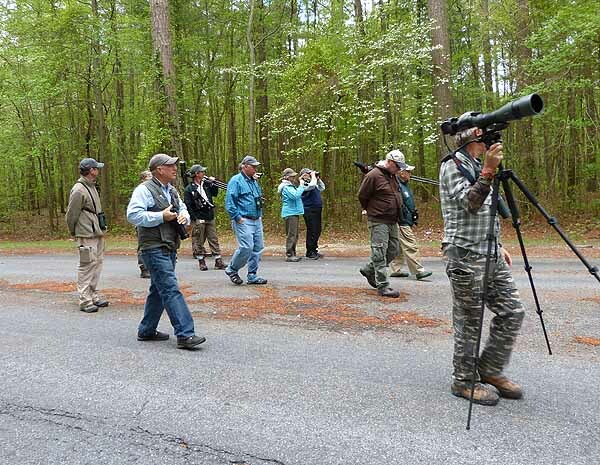 To the right of Roger, second from the right, is Karl Lukens, a long-time CMBO Associate Naturalist and co-leader. At far right is Clay Taylor of Swarovski Optik, a team sponsor and the one with all the newest high-tech toys and gear. He’s been kind enough to give me some of his photos for this article, which will greatly improve it. That’s me on the far left. Our day began at 5 AM at the Cape May Meadows near the southern tip of New Jersey. 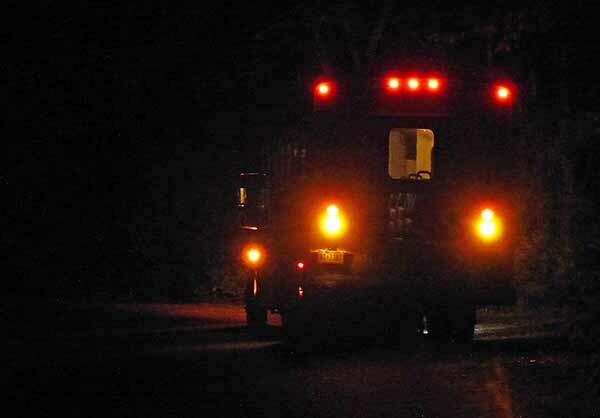 The top WSB teams go from midnight to midnight and cover the entire state, but you can also cover a single county, as we do with Cape May County. Our group has a little more relaxed schedule, and generally birds from 5 AM to about 9 or 9:30 PM. 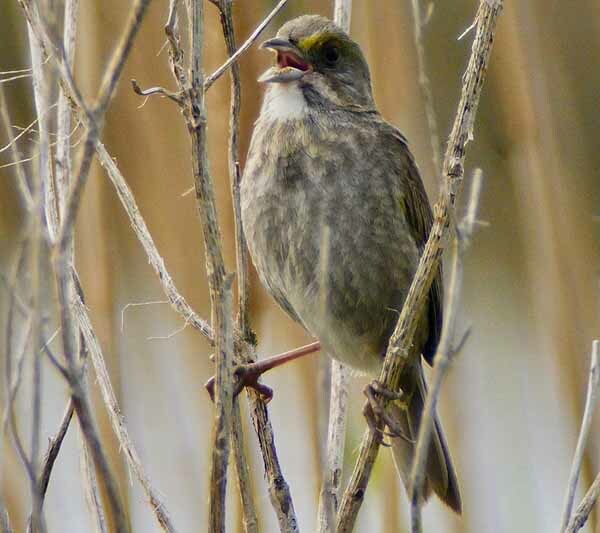 Last year our total of species identified by sight or sound was 134. The day before the area was swamped with heavy rain, so we didn’t know what to expect on Word Series day, Saturday, but we knew there wouldn’t be many new migrating birds coming to the area overnight, so our goal was to find all the ones already here that we could. After hearing a few birds calling at the Meadows, including American Woodcock, we drove to the Cape May County Airport. There, still in darkness, we gathered the calls of Chuck-Will’s-Widow and Horned Lark with a few others. 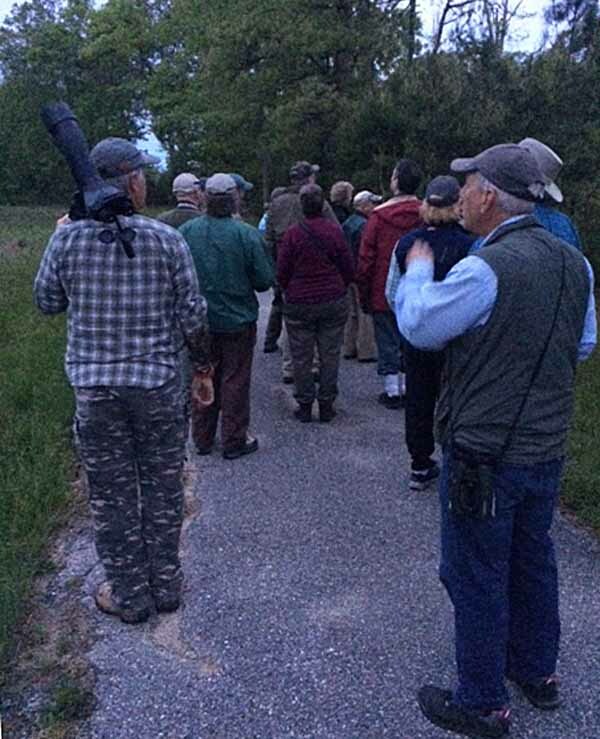 Then we drove to Cox Hall Creek Wildlife Management Area, where we walked and listened to the dawn chorus of songbirds in growing light, identifying birds like Osprey, Black-throated Blue Warbler and Tree Swallow. We left there at 6:15 AM with a tally of 38 species. The rain held off, it was cool and cloudy and somewhat windy, but pretty good birding. We stopped at Norbury’s Landing and Reed’s Beach, above, where we added many more species like Double-Crested and Great Cormorant, Common Tern and House Sparrow. Every species counts, even the common ones! In the first few hours of our Big Birding Day, it’s easy to pile on the species heard or seen, and fun to see the totals grow quickly. We left Reed’s Beach with 68 species at 7:30 AM, then stopped at CMBO’s Goshen center for bathrooms and a few more birds like Ruby-throated Hummingbird. Next we headed north and west up the Delaware Bayshore (note our bus in the background). We had two drivers, one for each half of our day. This was the best WSB vehicle we’ve had in a long time. The next stop was Jake’s Landing, also on the bayshore, where we were delighted to see the sun! It came and went over the next few hours, and as the air was cool, in the low to mid 60s, it was welcome. The wind also continued all day, but did not interfere with our birding until much later. At Jake’s we added species like Northern Harrier, Marsh Wren, Seaside Sparrow (above) and Nelson’s Sparrow, one I rarely see. We left Jake’s Landing at 9 AM with 83 species. Then we went a short distance inland to Belleplain State Forest, not far from where I live, and one of my favorite places. Last year I did extensive scouting here. This year I did some, but not as much as I would have liked, as we were away on vacation for a week not long before. 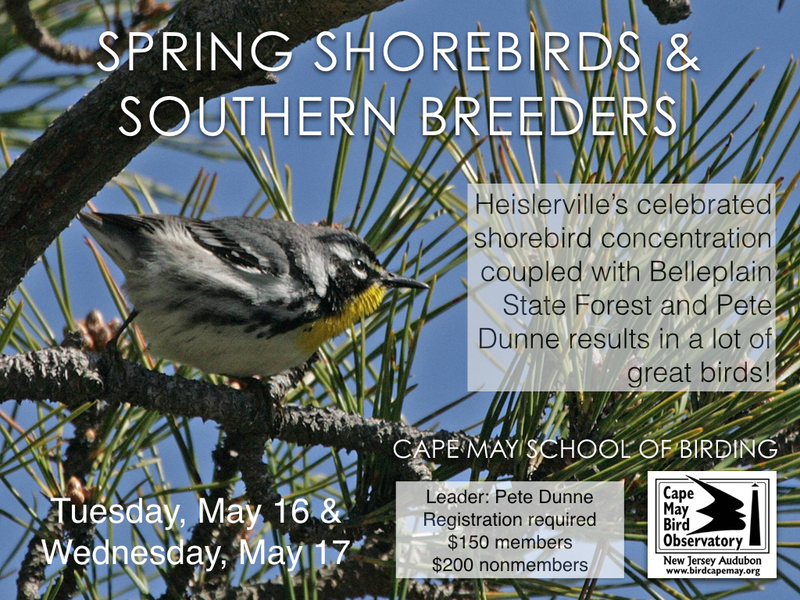 Belleplain is a great place for nesting songbirds that aren’t found in other areas of our county. 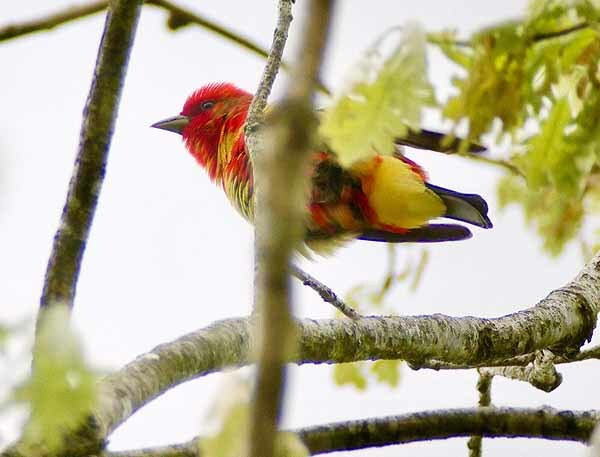 At one stop I’d scouted, near a Boy Scout Camp, we found a first year male Scarlet Tanager not yet in full breeding plumage, above. He was a mix of red and yellow instead of all red (except for black wings). 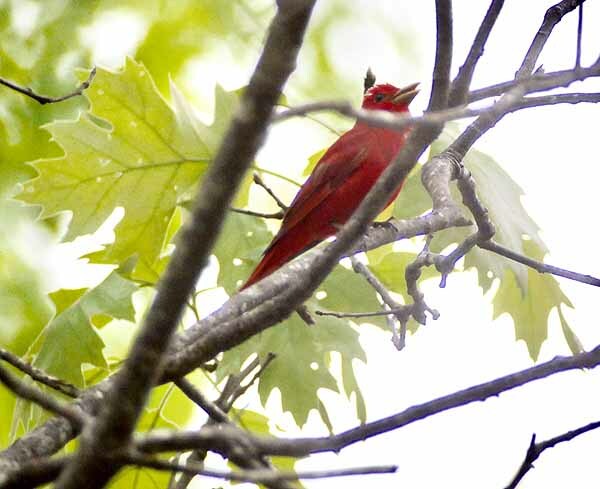 A Summer Tanager came in to chase him away. We saw and heard lots more great birds including Eastern Meadowlark, Acadian Flycatcher, Yellow-throated Warbler and many more. We left Belleplain at 11 AM with 104 species. At that point in the day, with so much of our goal accomplished and many hours remaining, it seems like it will be no problem to set a new team record, but we know from experience that the first 100 species are the easy part. Now it would get much harder. We headed back to Cape May and the Higbee Beach Wildlife Management Area next, where the wind-sheltered, sunny fields got pretty warm. We were in the midday lull, a time when birds get quiet and often nap, not good for our numbers. 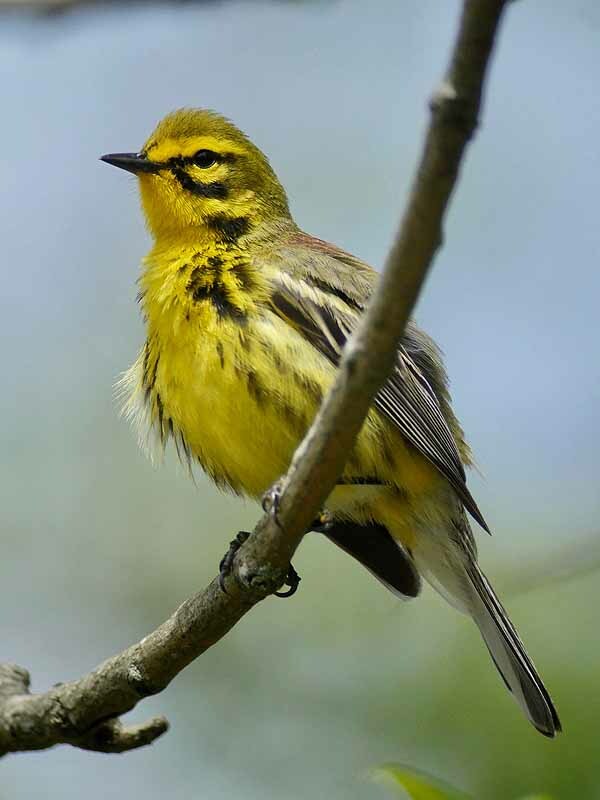 We did enjoy a few more cool birds like this Prairie Warbler, but we’d already counted that one in Belleplain. After walking around for over an hour with only a few new species to add to our tally, it was time for our own midday break. We ate our packed lunches at the picnic pavilion in the Cape May Point State Park, used the bathrooms, and rested up a bit before going out at it again. We don’t stop to buy food or drink usually, so you have to bring it all with you. I pack a large cooler filled with food and drink that gets me through the day. Afterwards we spent a short amount of time looking for new species there, but the leaders kept getting alerts about good things being seen at the Cape May Meadows. That’s a new aspect of birding these days: cell phones, texting, social media and birding informational sites like eBird are changing the way things are done. 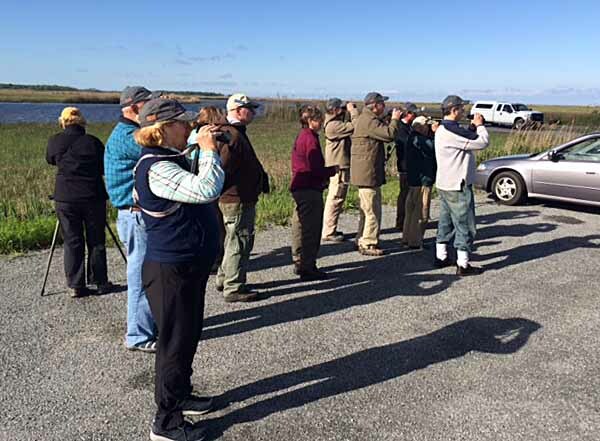 For the World Series of Birding, there are some things that aren’t allowed, but there’s also a message service between all the leaders to give tips on what’s being seen where. Karl Lukens’ phone was giving out his Black Rail call ringtone all day with those messages. Sometimes they were very helpful, more often we were far away from the sightings and not going there anyway. As new cloud banks rolled in, we walked the trails at the Cape May Meadows, where we’d begun our day hours earlier, and found lots of new things for our list, some of them rare. 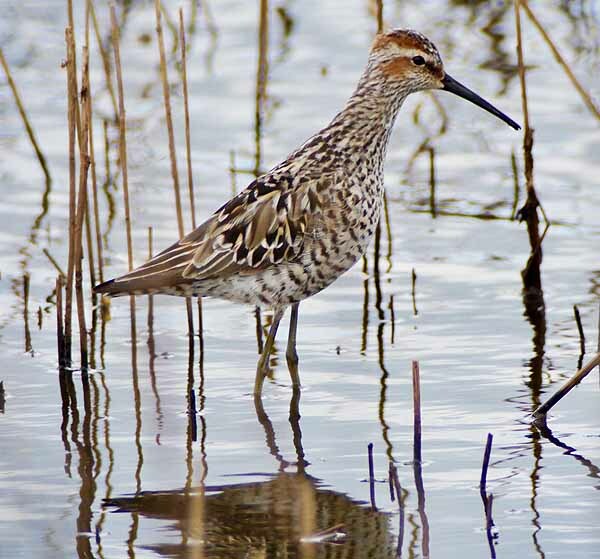 This Stilt Sandpiper, is a shorebird we don’t see often in Cape May. There were also Common Gallinule, Red-throated Loon, White-rumped Sandpiper and others. We lingered about two hours at this location, and considered it time well spent. One more stop a nearby nature area called The Beanery gave us great looks at Prothonotary Warbler, but nothing else new. At 4 PM we left the Cape May area again with 123 species on our list, headed for the Atlantic Coast. Our next stop was Nummy Island, between Stone Harbor and North Wildwood, where we added a few more species. It was beginning to rain a little now, but not enough to dampen our spirits. Birds don’t mind a little rain. A Red-winged Blackbird was singing loudly as we added birds like Whimbrel, Black-bellied Plover and Tricolored Heron to our list. 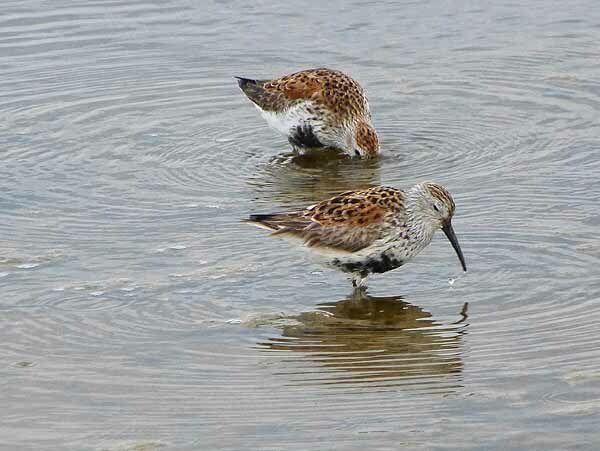 Some of the shorebirds here, like these Dunlin, we’d already seen on the Delaware Bayshore, but had better and closer looks at them on Nummy Island. At nearby Stone Harbor Point, we walked down the trail to find a rare Piping Plover, the same spot as last year. 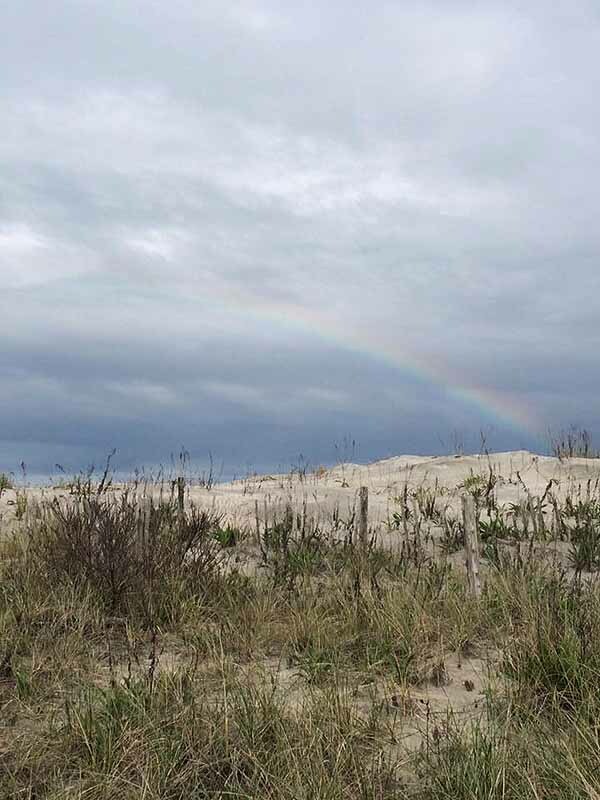 A faint rainbow appeared in the clouds over the ocean. 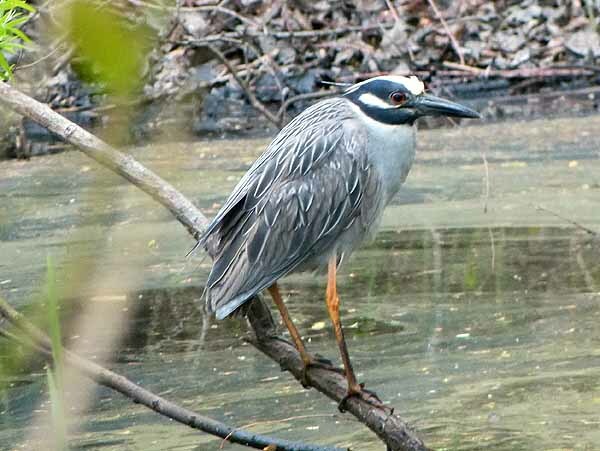 A drive north along the coast to Avalon allowed us to add Yellow-Crowned Night-Heron, always elusive, but easy to find if you know the right hiding place. We also stopped at The Wetlands Institute, where we added Peregrine Falcon. As we left the Atlantic Shore at about 6:30 PM, we tallied our species and found we’d reached 137, three more than last year’s total! We celebrated in an exhausted sort of way, and headed back to the northwest part of Cape May County for a last few hours of searching. The rain let up, but it was still cloudy and now getting more windy as we returned to Belleplain State Forest, and the bridge on Sunset Road. We spent another hour here, but added only one more species, Louisiana Waterthrush. The birds were quiet, and we missed a few we’d been hoping for, like Whip-poor-will. We made one last stop at Jake’s Landing and stood out in the cold wind listening for owls and such, as our bus waited patiently, but to no avail. After some minutes of that, we called it a day and headed back to Cape May at about 9 PM to get our cars from the Meadows, and for some of us, to go to the World Series of Birding Finish Line at the State Park. 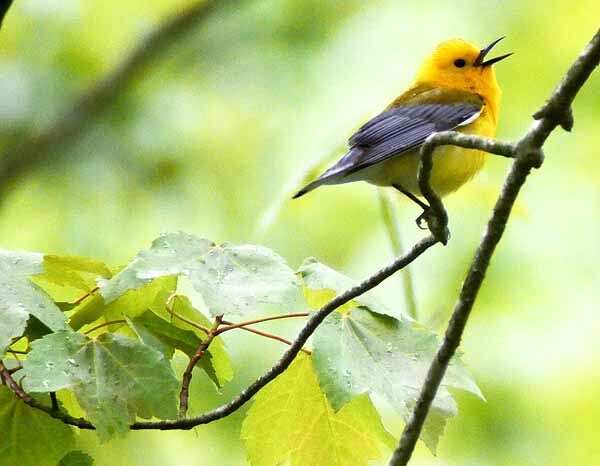 As the leaders went through our official tally sheet (now in digital form) to be turned in at the finish line, we found one species, Yellow Warbler, that was heard by leader Roger Horn, but no one else, so that one was removed. It left us with a total of 137 species, still quite good for our team, above our average of 130, and three more than last year’s total of 134, in worse weather conditions. We all felt we’d done well, and it had been a satisfying day. On Sunday, a brunch was held for those participants who wanted to attend. I never do that, as I’d rather be home working on this report and whatever else I need to do. After the awards are given at the brunch, the official results of the World Series of Birding are posted on their WEBSITE. 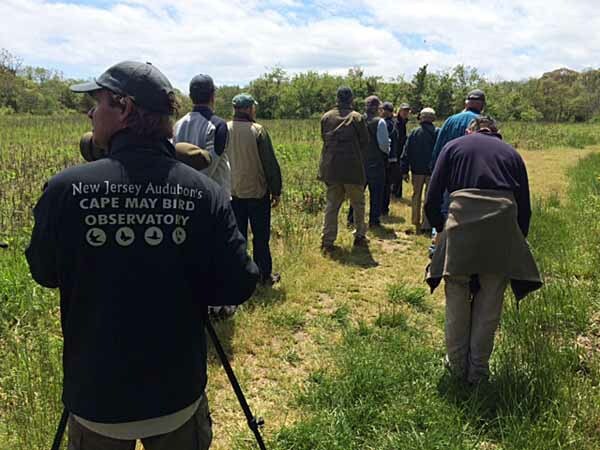 Thanks to my supporters and my own donation, I’ll be able to contribute pledges of several hundred dollars to the Cape May Bird Observatory for our team. It will take time for all the pledges and donations to be turned in and counted, but you can follow that on the main website page, and if you’re interested in our own team’s fundraising efforts, you can follow those HERE. Hope you’ve enjoyed reading about our birding adventures. No doubt I’ll be doing this again next year, and will blog about it then. Captain's Note - Thanks to Todd for taking the time to write this summary of a wonderful day, the team members that make it happen, Clay Taylor and Swarovski Optik for gear, equipment and camaraderie, and all the support, both financial and logistical, that make this such a great event for Conservation! 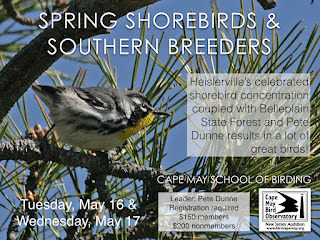 Heislerville’s celebrated shorebird concentration (not to mention the whole Delaware Bay) coupled with Belleplain State Forest (and nearby Cumberland County hotspots) – all resulting in a lot of great birds, all close together! 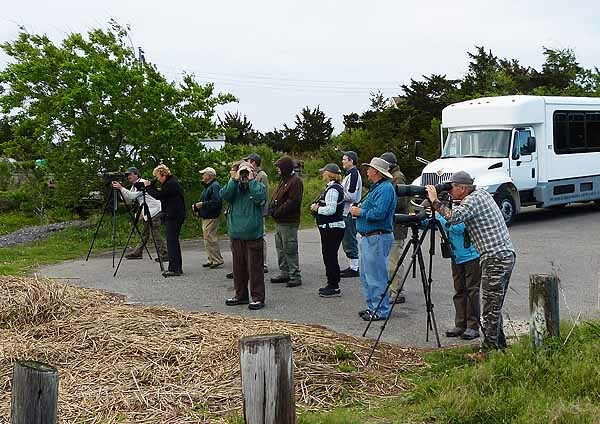 Red Knots, Dunlin, maybe a Curlew Sandpiper, plus woodland birds like Yellow-throated and Prothonotary Warblers, Summer Tanagers, and more on this Cape May School of Birding Workshop!! Even a Little Egret has been seen recently at Heislerville!